Like most appliances in the modern home, over time a central heating radiator can become damaged and unreliable. This is often caused by the sporadic nature of use on a radiator over the British summers, in comparison to the almost constant usage in the winter months, like central heating adiators my need to be serviced at the end of summer when they are once again in switched on, and found to have seized up or become blocked from under-use. Once repairs no long are cost-efficient, it is time to have the radiator completely replaced, especially with the advances in radiators – making them more energy efficient as well as reliable. If you would rather not risk removing your central heating radiator yourself, call me to do the job! Always be sure to check the plumber has all the relevant qualifications and experience to carry out the job safely and effectively, as well as allowing yourself the time to ring around several plumbers or companies to get the best quote possible without compromising on quality. Firstly, all radiators have two valves – one valve to let the water into the radiator, and another to let the water out. One of these valves turns the spindle inside to open or shut the pipe valve, called the wheelhead valve. The other valve is generally has a cone shaped cover in white, that will be easily removed to show its spindle beneath. This is called the lockshield. A variety that is becoming more common recently is called the thermostatic valve, and operates on the same principle. To begin, remove the lockshields head, and turn it as far as it will go using a small adjustable spanner. In doing so, you have closed the valve. Do the same on the wheelhead valve by turning its handle in a clockwise motion. You will notice that in between the valves and the radiator there will be a nut, which is part of the radiator itself. These nuts need to be undone, with the right hand nut turned away from you, and the nut on the left hand towards you to undo. These nuts stay on the radiator. What is very important when undoing these nuts, and tightening them again later, is to be sure that you have a firm grip on the valve with another spanner. It is best to use two adjustable spanners for this, one to undo the nut and one to hold the valve firmly in place. Do not allow these pipes to bend, as they have a tendency to leak if they do. 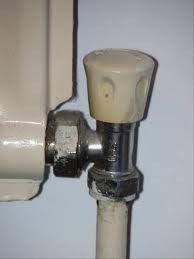 The radiator will be full of water, so be sure that you put some old rags or anything absorbent you don’t mind getting wet under the valves and around the pipes base, as there will be some leaking of water.